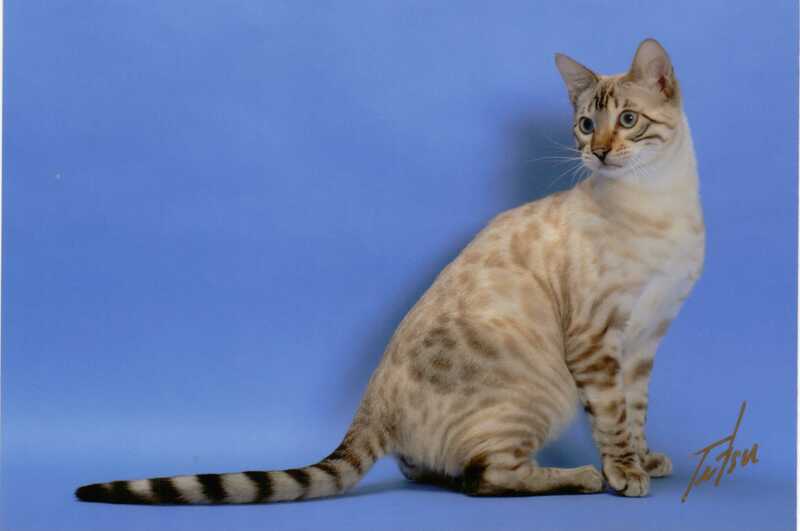 When people think of Bengal kittens and cats they most often envision the brown spotted patterned Bengals. Bengals come in other colors and patterns. These are photos of the more rare Snow Bengal cats that are formally called “Seal Spotted Lynx Point Bengals”. Our female snow Bengal cat. Our male Snow Bengal cat. Look at the outstanding profile on this little boy. He has a whited tummy like his Asian Leopard Cat ancestor. Despite his wild appearance, he is a domestic Bengal and is very gentle. He is a wonderful pet Bengal kitten. Let me know what you think. 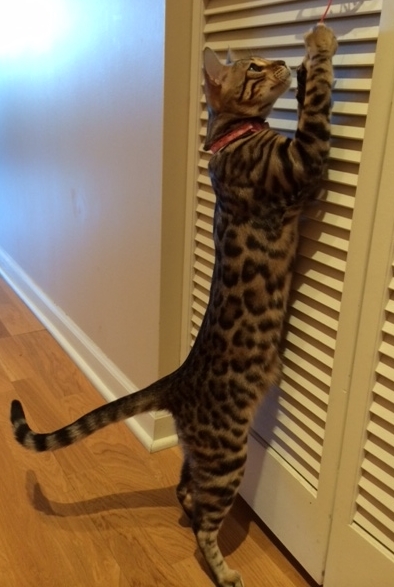 This is a photo of Adore Cats Bengals Seal Spotted Lynx Point (AKA Snow) Bengal kitten named Dena. Adore Cats Bengals Dena has a lovely profile. Dena is just 3 weeks old in this photo and is learning to walk. 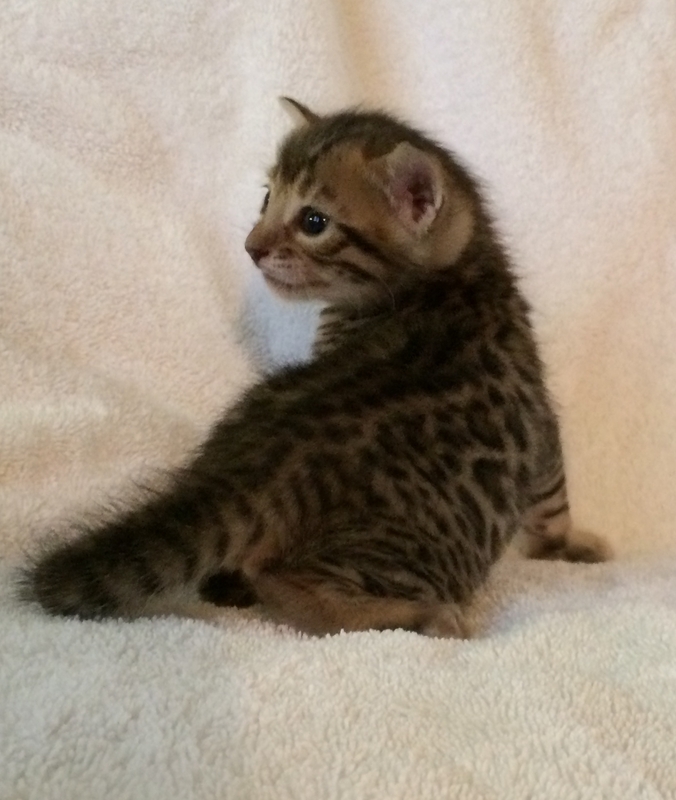 Many people are familiar with the Brown Spotted Bengals. The Seal Spotted Lynx Point Bengals are more rare and are not seen very often. When they are born they are almost completely white and look more like a tiny snowball. 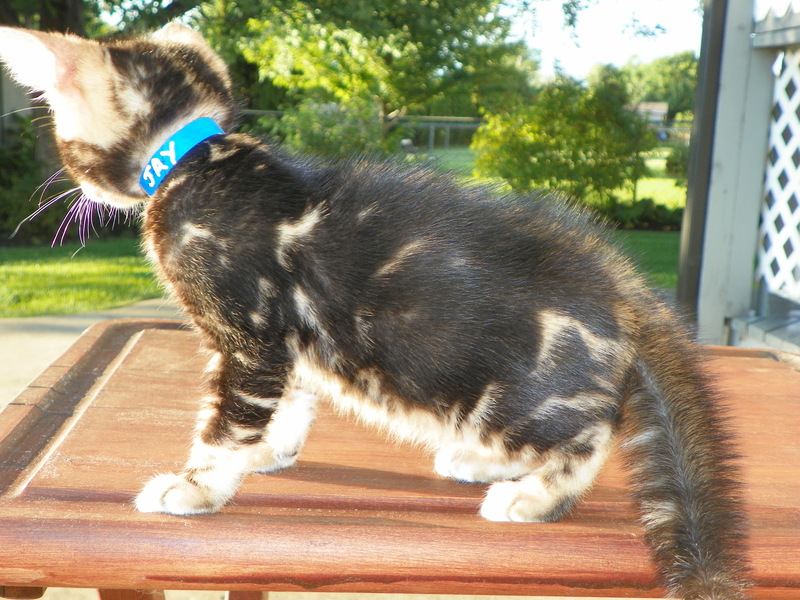 As they mature, their facial markings, tail and leg stripes start to come in. Then you can see very faint spots (and if it is an exceptionally beautiful one you will see rosettes) start to fade in as the kitten develops. 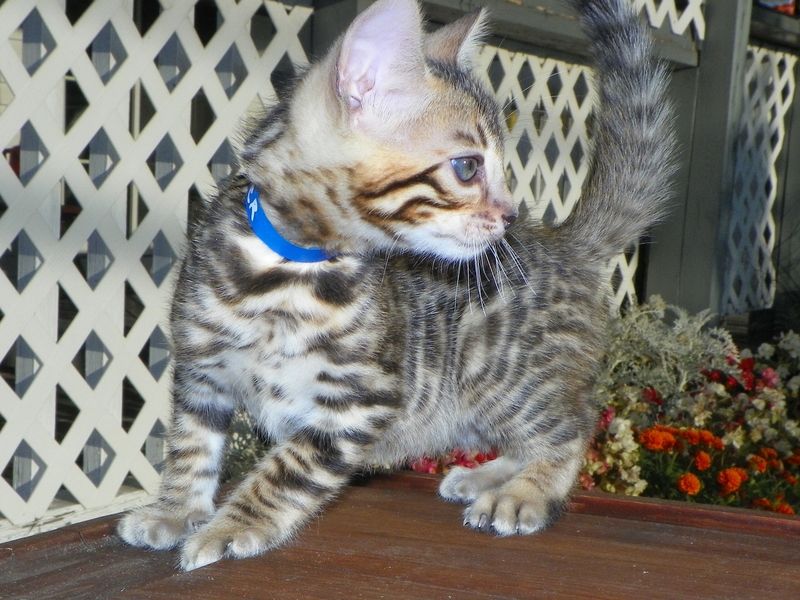 Adore Cats Bengals Dena has large rosettes already forming but you have to look closely to see them. Later, you will see their feet darken and turn black. When Bengals are born, their initial eye color is a hazy blue/black. After a couple of months, their eye color stabilizes to the adult color, which is commonly green or hazel. For the Seal Spotted Lynx Point Bengals, their eyes develop into a beautiful blue and remain blue throughout their lives. Their coat background and pattern changes, but their blue eyes are forever. Dena will look a lot like her mom, Starshine, when she grows up. 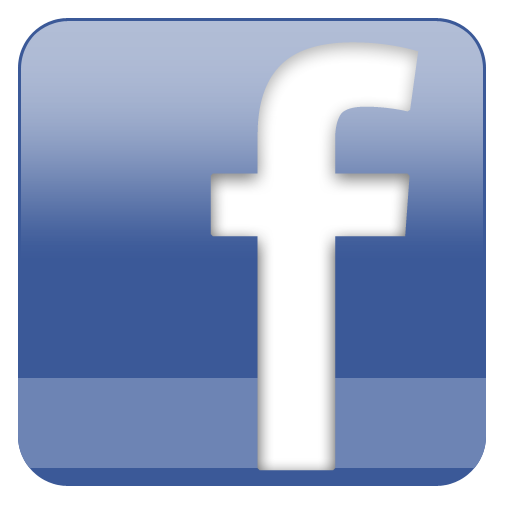 Starshine’s picture is below. This is Dena’s mom. We call her Starshine. She is spotted with lots of rosettes and a shiny glitter on her coat. 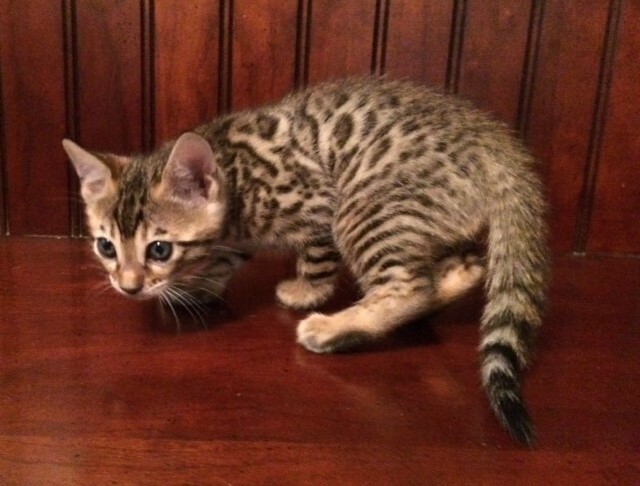 Stop by our site at: http://www.adorecatsbengals.com to see more photos of our Bengals and leave a comment to let us know what you think.